Despite my willingness to embark on what might seem to be a gratuitous frolic-and-detour in the pursuit of a non-essential prize — see, e.g., Monday’s post — I am a fairly practical creature and have limited interest in taxing my ingenuity with the maintenance of clothes. In general, I prefer things that I can launder myself in a washing machine; the next-best-thing is clothing that can survive dry-cleaning and repeated use over a period of years. Thusly, I view the rise of embellished garments — trimmed with leather, sequins, fancy beading, feathers, and suede — with a jaundiced eye. At one time, embellishments were reserved for formalwear. And now they’re everwhere! How? Why? 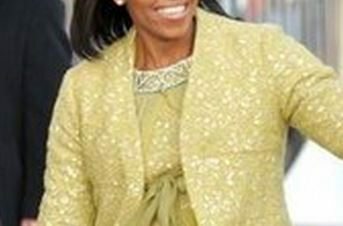 I date the start of this phenomenon — which one has to imagine is the work of an international cabal of embellishment manufacturers and dry-cleaners meeting in a super-sleek hideaway in either the Alps or the Andes — to Inauguration Day 2009, when Michelle Obama wore a day dress embellished with rhinestones at the neckline by Isabel Toledo. I am not making a case against embellishments, but only offering these thoughts. First, when you buy a garment that’s been embellished, think about its true cost. Many of us rationalize purchases using a peer-validated methodology called “Cost Per Wear” or CPW. Backward-looking CPW takes the cost of a garment and divides it over the number of times it has been actually worn by the purchaser. Forward-looking CPW is a similar analysis except that the denominator is projected rather than actual — i.e., the purchaser estimates the amount of likely use. Using either approach, the cost of the garment typically comes out to less than the price of 20 oz. peppermint hot chocolate at Starbucks. Such a bargain! But the embellished garment can throw a wrench in the math because embellishments necessitate dry-cleaning of things that ordinarily could be thrown into an ordinary load of laundry (e.g., the suede shouldered tee-shirt) or prompt the dry-cleaner to charge a premium for cleaning (e.g., a charge of $20 to clean a tricky dress, when the ordinary charge is $10 or $12). Second, embellishments may not be able to withstand the rigors of dry-cleaning. Even the most conscientious of clerks sometimes forget to wrap buttons and I can’t even imagine how feathers are protected. 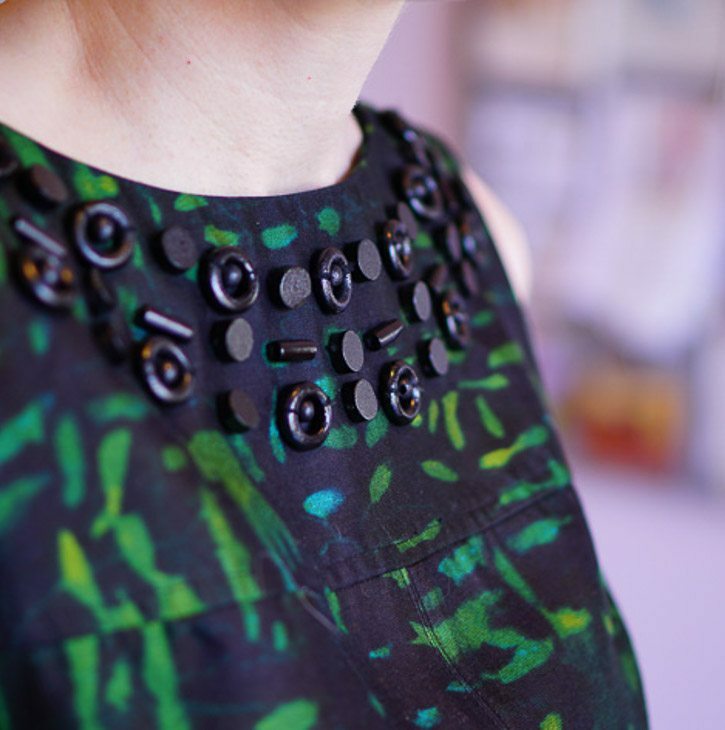 Then, the question you must ask is: If the embellishments are ruined, can they be replaced or removed? Often the answer is yes, but if the answer is no, that’s worthy of consideration. 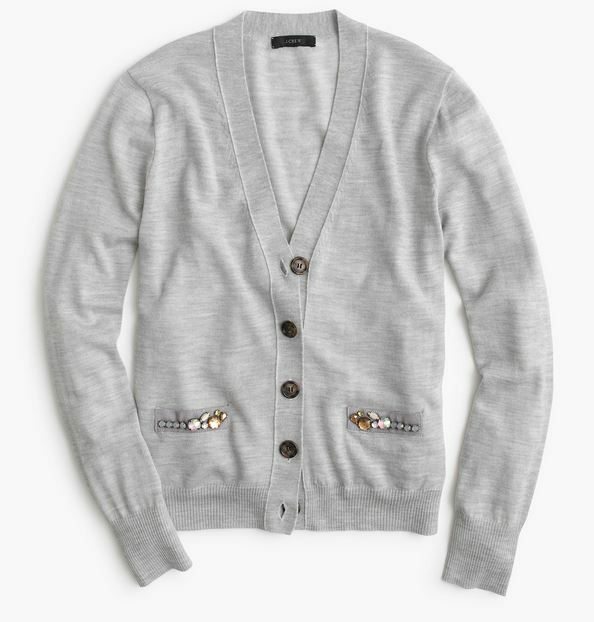 With all that said, the allure of that JCrew cardigan (cozy and sparkly, just the thing for the weekend) may prove too powerful to resist. Stay tuned. That J. 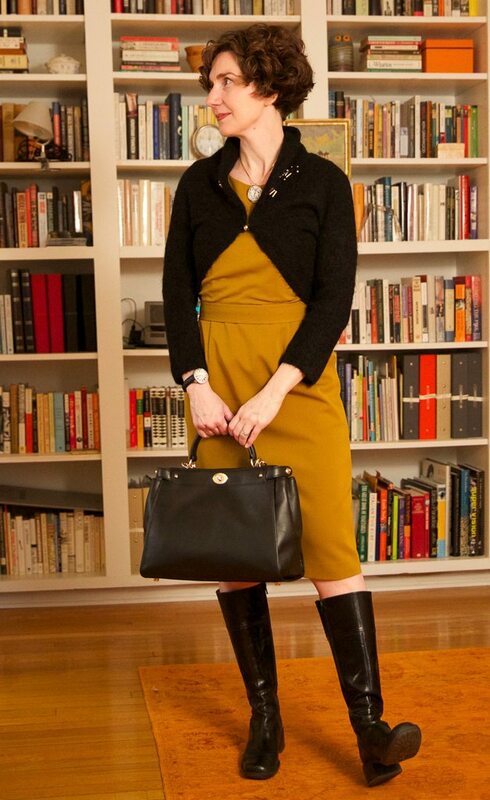 Crew cardigan is lovely, but I have to imagine you could get a very similar effect with a pair of vintage rhinestone barettes (or hey, not even vintage, probably) converted into pins that you could then attach to (and detach from) the pockets of a regular cardigan at will. Then you would have cozy, sparkly, durable, AND versatile, which has got to be some kind of sartorial quadri-fecta. Ooh, I like this idea and now I want to try it. SO clever. SUCH a good idea. I feel like I’ve also been seeing dressy bobby pins with little gems on them — that might be even easier. Very wise — I agree wholeheartedly. Unless your garment is ultimately destined for display in the Smithsonian, you probably want something more versatile and easier to care for. I’m in the non-embellishment camp. That’s what jewelry is for. 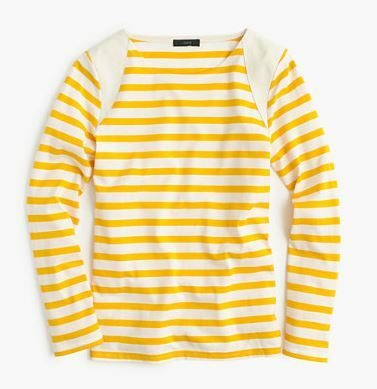 Extra pieces that can snag or fall off clothing? You’re just asking for trouble. ps…As for that J. Crew sweater…if you buy it, you should change out the buttons to ones more interesting (in my opinion)….keep us all up dated!! Fortunately, The Directrice comment log is a Big Tent under which diverse views can happily co-exist!